My current favourite tune to play on the sax is Aint Misbehavin by Fats Waller. It has a very jaunty rhythm and a nice bluesy riff in the middle. Dave is crazy about playing it too. He just looked up Fats Waller on Wiki and discovered that he was once kidnapped to play at Al Capone’s birthday party. For anyone thinking of kidnapping me, my repertoire also includes Georgia on my Mind, Fly me to the Moon, Pennies from Heaven, Tulips from Amsterdam, Take me to the Mardi Gras, Lazy, Hazy, Crazy Days of Summer, and Red Roses for a Blue Lady. I am working on The Girl from Ipanema and Chatanooga Choo Choo..
Oh, and if you’re going to kidnap me, could it be to play for Jon Snow ? …on a dark and gloomy November evening, just before tea, it’s nice to give your mother a very quick ring. I wish I could. I didn’t wake up until a luxurious ten to seven this morning, thanks to Dave being really, really, especially quiet when he got up way before dawn, as per usual. Sue: What time did you get up today? Sue: Oh my God. Why? Dave: You woke me up and I couldn’t get back to sleep. Dave: You asked if I’d slept well. You were talking in your sleep. Always remember that when your saxophone is cold, it squeaks. 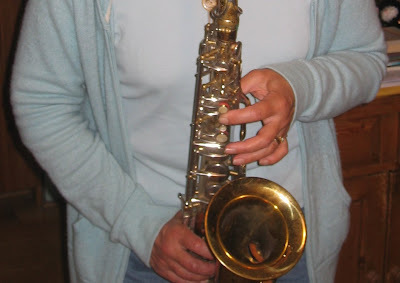 You must warm it up before you start to play.Then when your nice next door neighbour comes round and they see your sax lying in its open box, and they enquire about how your saxophone playing is going, you won’t offer to play for them. I forgot this top tip. I picked up the cold sax, and proudly launched into Georgia on my Mind, and the performance was full of humiliating squeaks. I felt really, really stupid. Pride goeth before a fall. When I was in New York, I popped into the Wall Street Borders to ogle an interview with me – yes ME – which appears in the 2010 Novel and Short Story Writer’s Market. The book cost nearly $20, which is why I was happy just to ogle. Now I’ve found out that it’s published over here as well – so I needn’t have gone all the way to NYC to see it. The journalist who wrote it is Diane Shipley, a talented young woman whose work I trust implicitly. 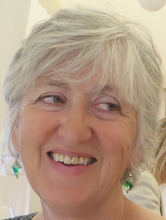 Watch this woman – one day she will be Big in Broadsheets. because the EU has NOT chosen as their president the man who ignored the will of the British people and lied to take us into an illegal war, making us complicit, by spending our taxes on the unjustified bombing of Iraq. I will not besmirch this blog by mentioning him by name. I am gradually working my way through the stuff I’ve brought home from my mother’s house, but I am baffled as to what to do with these. They are antique homeopathic remedy bottles and dispensing implements which belonged to my Gran. I don’t want them, they’re not suitable for the grandchildren to play with, and I can’t bear to throw them away. Does anyone have a sensible use for them, or alternatively, any helpful suggestions? I’d been awake for two hours without a cup of tea. That phone directory is open at the electricity emergencies page. The man said he’d be here within the hour so it didn’t seem worth lighting the log-burner and heating up water on top of that. But I was getting seriously snappy with Dave (“Will you stop playing my sax so LOUD! Go in the sitting room with it and SHUT THE DOOR!”) so Angela across the road - with her oil-fired Aga - came to the rescue. Aahh. Now I feel better. This is me – age 10. I’ve always been a show-off. This won’t be happening, if only because my progress on the slackline is so s-l-o-w. I’ll have a booking at Ronnie Scott’s before I can walk the line. I’ve been so discouraged with progress on the latter that I searched the internet for tips. The only one I could find was to forget trying to walk on it, and to learn to balance on one leg in the middle of the line. So rain permitting, that’s what I am doing. Isaac - juggling the fire clubs above (some years ago) - said that splitting up the skill into its constituent parts is definitely the way to go. When he was learning to juggle, he practised an hour a day (during his finals) at just making throws, so the balls came down in the right position. He didn’t attempt to catch them. I have just re-read one of my favourite books – Breathing Lessons, by Anne Tyler ( to see how she did it.) And this morning, I was checking something else out on amazon.com and thought I’d take a peek at what readers had said about Breathing Lessons. Most people loved it – no surprise there - but there was the odd one that exploded my head …e.g. Well, OK, if she doesn’t like the book and its subject matter, but it's ignorant to say that Anne Tyler doesn’t write well. I don’t know why I expect people who comment on books online to say intelligent things. Why do I? I liked that sentiment, and I’ve been wondering if it applies to life as well as to improvisation. Sadly, I don’t think it does. This morning in bed, I finished (re-)reading Joan Didion’s The Year of Magical Thinking, which I liked a lot, but not as much as the critics did. In case you haven’t read it, it’s a writer’s memoir about the sudden death of her husband (of 40 years) and the writer’s subsequent grief. I think slacklining might just be too hard. Sometimes I lie in bed in the morning and wonder which part of my life to tell you about. Do I tell you about waking up in the morning and thinking about the day ahead, and that when I remember my saxophone, a big smile spreads across my face? Or do I tell you about my lovely, cheerful, laid-back big sister coming to see me yesterday for lunch and a walk in Lathkildale, and how she brought me a surprising and beautiful birthday present - a Rowan tree that has red leaves in the autumn and yellow berries, and how when she left to go home I felt bereft, and how for the rest of the day I felt sad about our mother dying? Or about how when Dave came home in the evening, he brought me a present from my sister-in-law – a gorgeous, turquoise top that fits me as if it was made to measure? Slacklining – 9 unaided steps. By the way – technically, I can call it untethered slacklining as I don’t wear a safety harness. Just like this guy, Dean Potter, slacklining above Yosemite. Saxophoning – Mel gave me a high five for my rendition of Black Hills of Dakota, which I have been practising instead of my homework. Mel is my kind of teacher. Next up – my homework (Solitude) and Georgia on My Mind. Yeah! Who do you think you are kidding, Mrs Teacher? For my last sax lesson, Mel, my teacher, gave me a beginners jazz book and asked me to practise a number called Solitude, in which there are 8 bars of improvisation. Improvise? Moi? This was my third lesson. What was she thinking? But with two days to go to my next lesson I thought I should get out the jazz book and have a go, and do you know what? Instead of instructions in 17th century Italian, like Moderato, or Valse lente, or Andante, the jazz instructions are relaxed and friendly, such as Bluesy, with a heavy, laid-back feel, or Solid groove, or Childlike but groovy or Cheekily. I think I am going to like it. re the pic above…I was wearing a pinny because I was playing in the middle of cooking tea. So why was I standing on the landing? Because Dave was working at his computer in the spare bedroom and pretending not to listen a tad too well i.e. forgetting to shout out words of encouragement. When I was young I despised slapstick as an inferior sort of comedy. I was a little bit iffy about puns as well. Now – in the right circumstances - I enjoy them both, and I am wondering whether I should be worried. I don’t class myself as an intellectual, but is this new taste in comedy a sign that I’m becoming even more lowbrow than I was already?